Poster’s Note: One of the many under-appreciated aspects of NASA is the extent to which it publishes quality science content for children and Ph.D.’s alike. NASA Space Place has been providing general audience articles for quite some time that are freely available for download and republishing. Your tax dollars help promote science! 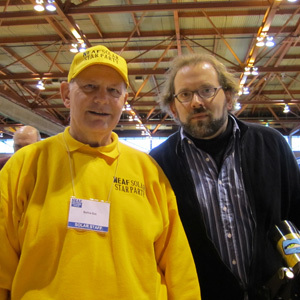 The following article was provided for reprinting in February, 2013. How does NASA get its ideas for new astronomy and astrophysics missions? It starts with a Decadal Survey by the National Research Council, sponsored by NASA, the National Science Foundation, and the Department of Energy. The last one, New Worlds, New Horizons in Astronomy and Astrophysics was completed in 2010. It defines the highest-priority research activities in the next decade for astronomy and astrophysics that will “set the nation firmly on the path to answering profound questions about the cosmos.” It defines space- and ground-based research activities in the large, midsize, and small budget categories. 3. Using astronomical measurements to unravel the mysteries of gravity and probe fundamental physics. For the 2012-2021 period, the highest-priority large mission recommended is the Wide-field Infrared Survey Telescope (WFIRST). It would orbit the second Lagrange point and perform wide-field imaging and slitless spectroscopic surveys of the near-infrared sky for the community. It would settle essential questions in both exoplanet and dark energy research and would advance topics ranging from galaxy evolution to the study of objects within the galaxy and within the solar system. Naturally, NASA’s strategic response to the recommendations in the decadal survey must take budget constraints and uncertainties into account. The goal is to begin building this mission in 2017, after the launch of the James Webb Space Telescope. But this timeframe is not assured. Alternatively, a different, less ambitious mission that also address the Decadal Survey science objectives for WFIRST would remain a high priority. The Astrophysics Division is also doing studies of moderate-sized missions, including: gravitational wave mission concepts that would advance some or all of the science objectives of the Laser Interferometer Space Antenna (LISA), but at lower cost; X-ray mission concepts to advance the science objectives of the International X-ray Observatory (IXO), but at lower cost; and mission concept studies of probe-class missions to advance the science of a planet characterization and imaging mission. For a summary of NASA’s plans for seeking answers to the big astrophysics questions and to read the complete Astrophysics Implementation Plan (dated December 2012), see science.nasa.gov/astrophysics/. 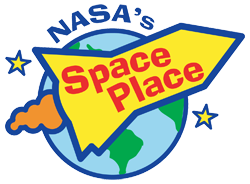 For kids, find lots of astrophysics fun facts and games on The Space Place, spaceplace.nasa.gov/menu/space/. 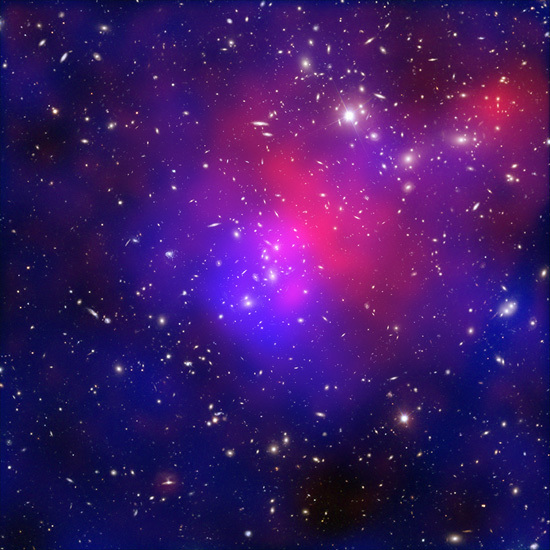 Caption: Clusters of galaxies collide in this composite image of “Pandora’s Cluster.” Data (in red) from NASA’s Chandra X-ray Observatory show gas with temperatures of millions of degrees. Blue maps the total mass concentration (mostly dark matter) based on data from the Hubble Space Telescope (HST), the European Southern Observatory’s Very Large Telescope (VLT), and the Japanese Subaru telescope. Optical data from HST and VLT also show the constituent galaxies of the clusters. Such images begin to reveal the relationship between concentration of dark matter and the overall structure of the universe. Dr. Steven R. Goodman, Executive Director, International Institute of Biomedical Sciences and Technology (IIBMST) will present “Technology that enables the IIBMST to conduct medical research and the development of biomedical products without walls, geographic, or scientific boundaries.” People interested in learning more about biotechnologies are invited to attend the free TACNY Sweet Lecture presentation on Wednesday, March 13, from 5:30 p.m. to 8 p.m. in Room 146 of Baker Hall on the SUNY College of Environmental Science & Forestry campus. Networking starts at 5:30 p.m., the speaker is introduced at 6 p.m., the presentation is slated to run from 6:15 p.m. to 7:30 p.m., and the event ends at 8 p.m. following questions from the audience. Admission is free and open to the public. Walk-ins are welcome, but we ask that people RSVP by emailing sweet.lecture@tacny.org by March 8, 2013. Dr. Goodman is also currently the Vice President for Research/Dean, College of Graduate Studies, a Professor in the Department of Biochemistry and Molecular Biology as well as Professor in the Department of Pediatrics at SUNY Upstate Medical University. He has over 35 years of collaborative international medical research from molecular and cell biology to infectious diseases. He has patented a novel Sickle Cell Anemia Treatment technology, authored a long list of books and research papers, and advised dozens of post graduate and postdoctoral researchers who are making significant contributions to understanding and solving medical challenges. In 2011 Dr. Goodman was the recipient of the Distinguished Scientist Award from the Society for Experimental Biology and Medicine. Dr. Goodman earned his PhD in biochemistry at the St. Louis University Medical School and his BS in Chemistry at SUNY Stony Brook. The IIBMST is a diverse group of international faculty that integrates expertise in basic and applied biological, physical, computer and engineering sciences to advance science, medical research and the development of biomedical products. It is an institute without walls, geographic or scientific boundaries that facilitates collaborative research within the areas of overlap among academic discipline. The IIBMST includes focus groups for cancer; diabetes; disorders of the nervous system; infectious diseases and emerging pathogens; pharmacogenetics and personalized medicine; and stem cell biology and regenerative medicine. Click HERE for a full-sized PDF. 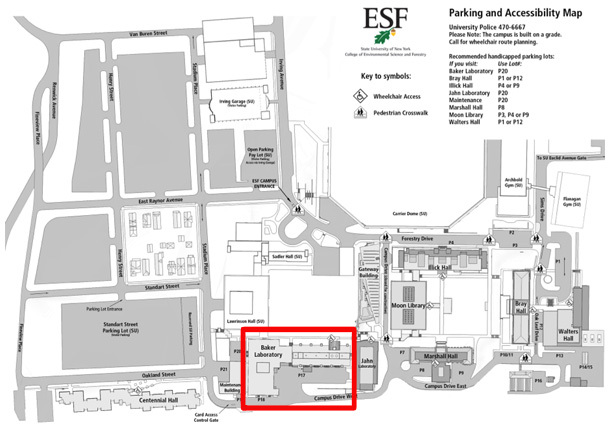 Click HERE For An Event Parking Pass.